I vividly remember the very first time I went in a UK supermarket and tried to make a section as to the loaf of bread I should take back home! You see where I come from in Southern Africa, there really was no choice. It was a loaf of bread or nothing. Ok, perhaps I am exaggerating a little as I am sure there was the choice between brown and white, but that was it! So what has this all got to do with Nikon and birding I hear you ask? Well my point is that choice is generally good, but sometimes it can make it somewhat difficult, even overwhelming (and time consuming) to make the right selection one is right for you and what you need. 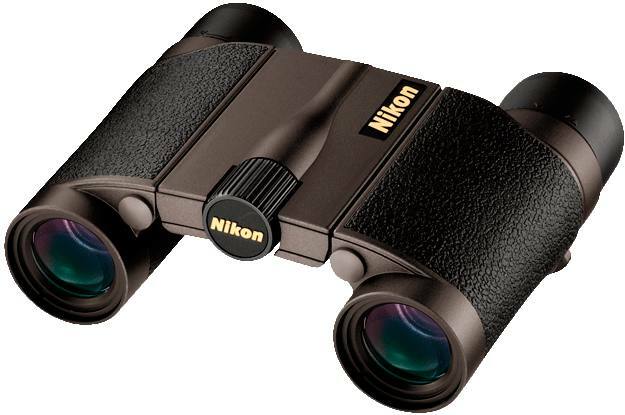 Thus as you would expect from one of the largest optical instrument manufacturers on the planet, Nikon Sport Optics produce a massive selection of binoculars and literally have one for just about everyone's needs and budget. Within "birding" there are actually different subsets which can be important to keep in mind. So for example searching for tiny, fast moving birds hopping about erratically in the canopy in a thick forest is very different to scanning over a wide open coastline observing large, more predictable seabirds. So it stands to reason that the absolute perfect pair of binoculars for each of these extreme scenarios will be somewhat different. Although having said that, if like most people you find yourself birding in a variety of different situations, rather than having to buy more than one instrument, you are probably best off getting a good general birding binocular that will perform well in most situations. So for this article, this is exactly what I have focused on, my selections below are based on general birding and the instruments that will suit a wide variety of situations. So here important features that I have looked out for in my list of the best Nikon binoculars for birding include the potential for a good quality image, especially in lower light conditions like early in the morning, late afternoon and early evening and in forests, where and when a lot of birding takes place. A wide field of view is also an important aspect as this makes scanning for, locking onto and following birds much easier than a narrow one. If you would like to get a more detailed information of these and all the other important features that I haver taken into account when making these selections, please refer to my Buyers Guide to the Best Birdwatching Binoculars. First off the slightly lower power means that in many cases you are most often rewarded with a wider field of view and this is most certainly the case with the 7x42 Nikon EDG as it measures a massive 419 ft wide at a distance of 1000 yards away. Image brightness in low light conditions will also improve for many users as you get a larger 6mm exit pupil (42 ÷ 7) compared to the 5.25mm you get on an 8x42. For more on take a look at this article on the exit pupil & image brightness. 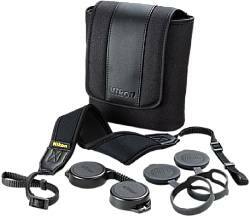 There is no doubting the quality of the optical components and coatings used on the Nikon EDG binoculars. The optics are fully Multicoated, the lenses have ED (Extra-low Dispersion) elements and employ a field flattener system to reduce field curvature. The prisms have also been phase corrected and have multilayer coatings of the best, very highly-reflective dielectric material, meaning more light gets transmitted and in the right way for the brightest, highest quality views possible. 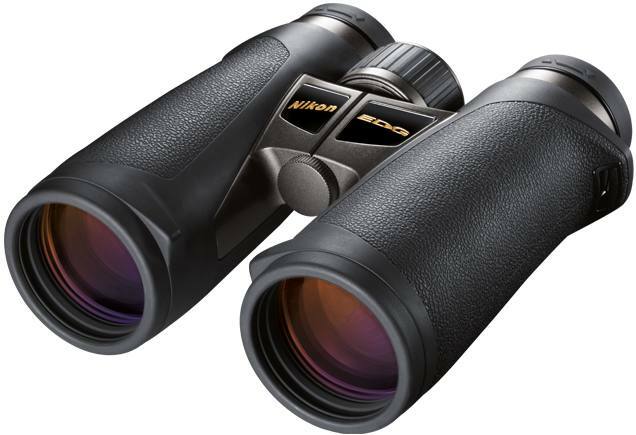 With a list price of $3280 and currently selling at around $2290, there is no denying that the 7x42 Nikon EGE is not cheap, but these are easily a match for ANY birding binocular currently on the market. Period. There is no denying the pedigree of the EDG above, however the premium level price tag will exclude many people. The HG uses the same ED glass as the EGE, the same field flattener lens system, has dielectric and phase corrected coatings on the prisms and is fully multi-coated. The also have a magnesium chassis just like the EDG and even details like a locking diopter adjuster are the same. To be honest it is hard to see why these don't cost far more or indeed why the EDG does not cost a whole lot less. The main difference here is that you don't get an option of a 7x magnification, however you actually get a wider view. So the only downside is that the smaller exit-pupil will mean that these may not see quite as bright in very low light. 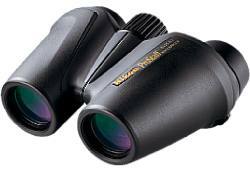 But even then the fact that they use such high quality optics means that these will no doubt perform at least on a par with the very best 8x42 birding binoculars on the market. With just about all the same features and optical components as the EDG above it is incredible to note that the Monarch HG costs less than half the price (currently retailing for about $980) and this for me offers extremely good value for what is a top end instrument and which matches the flagship model in most other manufacturers lineups. I could be wrong here, but I think the Nikon HG series is a recent addition, so up until fairly recently the Monarch 7 series was Nikon's second in line and as such is still a very high end device, but comes with a more pocket friendly price tag. The level of optics and coatings used is very similar, indeed the only difference that I can see is that the Monarch 7 does not have the field flattener lenses like the EDG and HG lines do, but at this price range this is what you would expect and so these will be no different than any of their direct competitors. At 420ft wide at 1000 yards, the field of view is still up there with the best and they come with what should easily be enough eye-relief should you wear glasses. Indeed the only slight downside is the 8.2ft minimum close focus distance, which beats the EDG and should still be perfectly fine for nearby bird watching, but means that these may not be the ideal if you also like viewing things like butterflies or flowers from very close ranges. So far we have only looked at roof prism binoculars. But I know that there are many birders who prefer the more traditional shaped porro prism design. Apart from ergonomics, a porro prism bin has a number of advantages and can be often be a better option if you are on a more limited budget as they do not require the expensive phase correction and highly reflective coatings on the prism to achieve the same quality and level of transmittance as a roof prism one does. The porro prisms used in these are made from BaK-4 glass, which is important. This design of prism also means they they do not require any additional highly reflective coatings to achieve total internal reflection as the roof prism models do, nor do they need to be corrected for phase shift. This means that the prisms are cheaper to make and yet will perform at the same level as high end and much more expensive roof prisms. 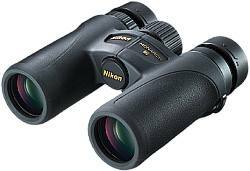 So whilst they lack the ED glass and are not fully multi-coated, at this low price (see below) you still will get a more than competent birding binocular, especially when you consider the very wide field of view. One downside that I can see is that the minimum close focus of 16.4ft may rule these out as ideal backyard bird watching binoculars where many people like to view birds on feeders at really close range. 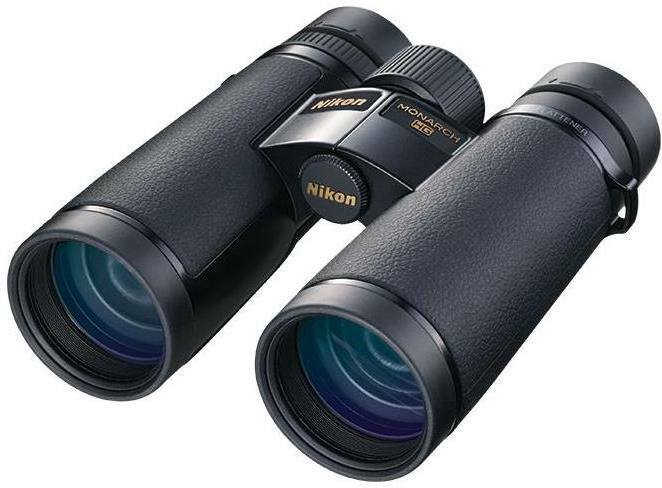 At under $130, the 8x40 Nikon Action EX is a seriously good option if you still want a birding binocular with a great image and a really wide view, but are on a tight budget. Because the smaller objective lenses capture less light, if you want a quality image and one that can show of birds in all their splendor, then it is important that the optics on your mid sized instrument is of a high standard and so optimally use what light they have. 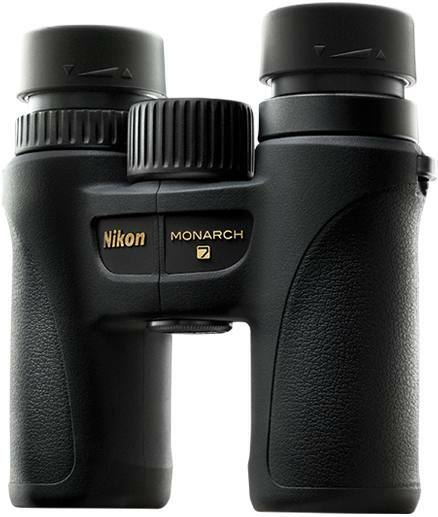 Thus it is mainly for this reason that I have gone back tho the Monarch 7 series as my choice of the best mid-sized Nikon birding binocular as they combine a high level of optics with a more than competitive price tag. 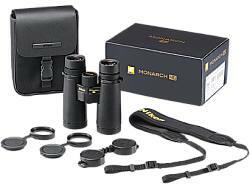 With the 8x30, you get the same optics as the full sized Monarch that I have listed above, but along with a smaller size and reduced weight, you get an even wider view and closer minimum focus distance. The eye-relief is a little less, but the 15,1mm still should be enough for most eye-glass users. 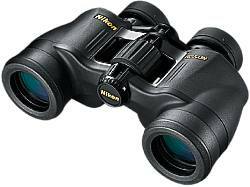 Nikon make a lot of compact binoculars and many of them are what I would describe as being within the inexpensive to cheap price ranges. Many of these cheap instruments are fine for the occasional user, but for the BEST compact Nikon bird watching binocular I have opted for a higher end instrument as I feel it is more important than ever to have quality optics to make be best use of the limited amount of light that a compact can collect and use. I also really like the double hinge design on these which means they can fold up to a much smaller shape than a single hinge compact, making these a true pocket size compact. With it's 330-foot field of view and good quality porro prisms, I feel it is a good low cost (about $110), compact birding binocular from Nikon. As I mentioned above, when it comes to the cheaper end of the market it is often a really good idea to go for a porro prism binocular over a roof prism one. They are far cheaper to make and thus you get the same quality of image as a much more expensive roof prism binocular. or if you look at it the other way around, for the same price, you usually get a better image than a roof prism binocular at the same price. The 7x35 Nikon Aculon goes back to the more traditional 7x power, which helps with image brightness in low light and maintaining a wide view. Indeed at 488ft wide at a distance of 1000 yards, the FOV on these is incredible, the widest of every option on this page and good for birding. 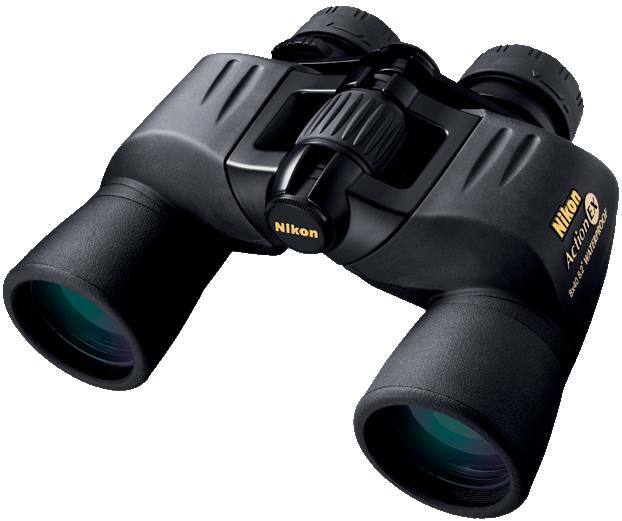 I would also suggest that because of this wide view, their low power, low cost and fairly small size that these also make a good option as a great first time birding binocular for a older child or teenager. What is not so great on these is the short amount of eye-relief, which means if you wear glasses, I would probably look at another option. 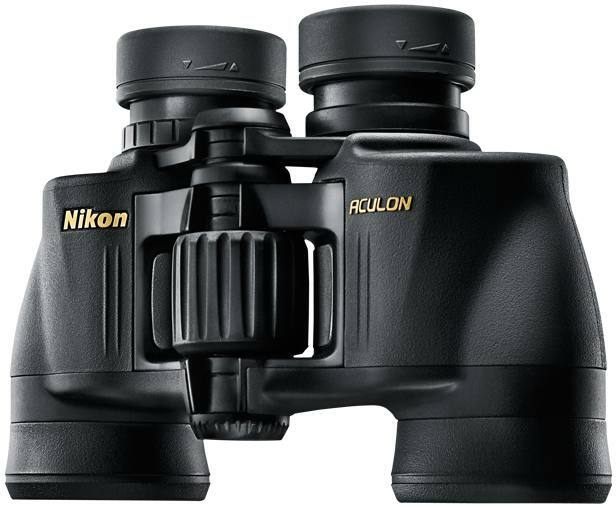 Also the close focus distance is not that near, so if you often view insects or even birds form very close range, the Nikon Aculon 7x35 binocular will not be the ideal choice. Nikon have some great options when it comes to birding and whilst I started this article saying their selection was massive and I have narrowed it down a huge amount, I do feel that this shortlist is still quite long! 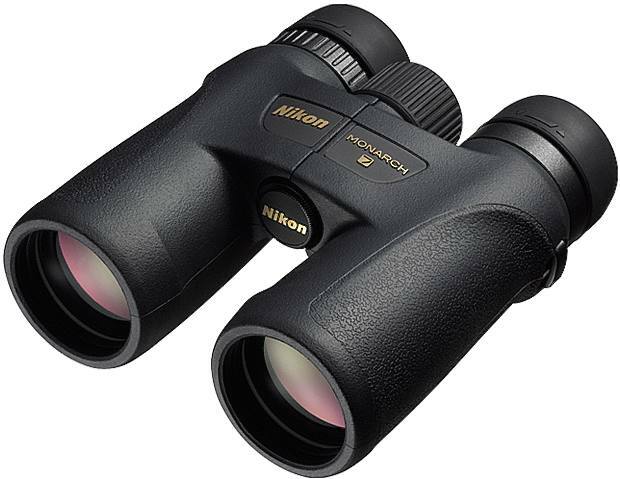 The seven instruments that I have selected above as the Best Nikon Binoculars for Birdwatching range in price from over $3000 to well under $100 and as such I am sure you can appreciate the difference in the levels is substantial. However as with most things, the higher up you go the more and more you have to pay for smaller and smaller improvements (diminishing returns) and so whilst the Nikon EDG may be more than 30x more expensive than the cheapest option on this page, they are far less and 30x better. Much better yes, but not 30x better. How much you decide to spend will largely depend on your personal circumstances, how often you use your optics and how much you want to get out of them. My advice as always is to spend as much as you can comfortably afford to loose! I hope this helps and I would love to know if you have any ideas or alternatives that you would like to add. Please feel free to contact me if you do.